Jon Ferguson an openly gay Oklahoma man was nearly killed on Saturday night after his car was vandalized and the firebombed behind his home. It happened the morning of Saturday, July 21, in an alley behind his home on N.W. 140th Street near Western and Memorial in Oklahoma City. Jon Ferguson says his car alarm woke him up and when he walked outside, a couple of people were vandalizing his car. As Ferguson approached them, one of the suspects threw something in his Camaro that caused an explosion and fire. Ferguson rushed inside his home and called 911. He also jumped in the shower and attempted to peel parts of his melted shirt off body. One of his roommates took a photo of the burning car while waiting for fire and police crews to arrive. Ferguson was rushed to the hospital in an ambulance with first and second degree burns to his face, arms and torso. He was treated and released. On Sunday, the 25 year old returned home for the first time since the fire. He’s frustrated because he has no idea who did this; but to make matters worse, the vandals spray painted a three-letter homophobic slur on his car. Ferguson is an openly gay man now doubting his decision to come out. The fire department has classified the attack as arson and local police, who say they have no suspects, have not yet called it a hate crime. 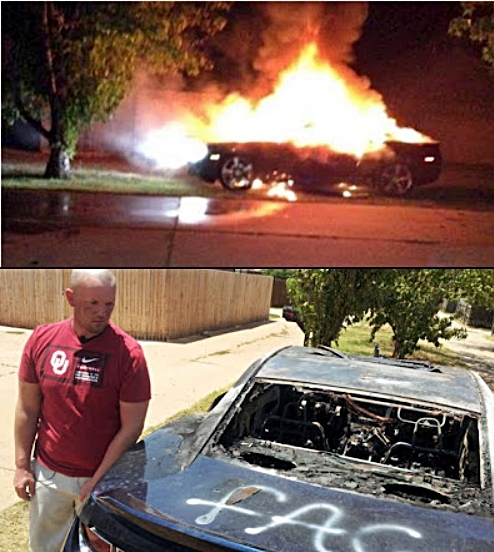 Gee, Oklahoma City Police he had the word “fag” spray painted on the car before it was firebombed and you’ve not labeled it a “hate crime”. Oh yeah that’s right I forgot. In Oklahoma, and of course it would not be called a “hate crime” since Oklahoma is a “christian” state and they “never hate” anyone. And besides those God-fearing “Christians” were simply exercising their First Amendment right to inform him of their distaste for his immoral lifestyle choice and if you call it a “hate crime,” you’re violating their free speech!